Analysis: Izzo was a decent collegiate player, making 20 catches for 317 yards and three touchdowns during his senior season at Florida State. He won't be eligible to return in 2018, leaving Rob Gronkowski and Dwayne Allen as the top duo at tight end moving forward. Analysis: The seventh-rounder needs to get back on the field as soon as possible in order to make a run at a roster spot. 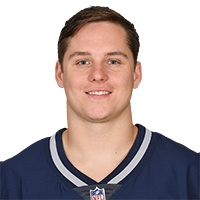 At this stage, Rob Gronkowski, Dwayne Allen and Jacob Hollister slot in as the Patriots' top three tight ends, so it may take an injury to one of those three players for Izzo to survive roster cutdowns. Analysis: Izzo was a seventh round pick for the Patriots in this year's draft and is currently fighting for a roster spot. It's unclear how severe the injury is, but any time Izzo misses is costly for the rookie at this point in the preseason.